Opening hours: Shops are generally open all day from Monday to Saturday between 8/9am-6.30/7.30pm. Smaller shops are open from Tuesday to Saturday and close for lunch between 12.30pm-2pm. French food will keep your stomach full and the beautiful scenery will please beyond any doubt, but you will also have your hands full when it comes to activities in and around Rouen. The area is not only full of historical sites, but also very popular for outdoor activities like hiking, cycling and other sports. The Notre Dame Cathedral is a must-see, not to be confused with its namesake cathedral in Paris. This was the cathedral that inspired Monet to paint his cathedral series. 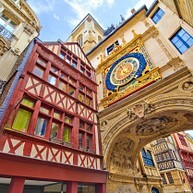 Wandering the streets of Rouen you will also come across The Gros Horloge, a beautiful clock right above a pedestrian street and one of its most recognisable sights. With its striking Gothic architecture and beautiful stained glass, this historic cathedral is Rouen's primary attraction. Inside the cathedral you can find the tomb of Richard the Lionheart. Notable trivia: the cathedral was struck by lightning several times over the centuries, resulting in various degrees of damage. Founded by Napoleon I, the Beaux-Arts Museum of Rouen contains an extensive collections dating back to the 15th century, with its collection of paintings constituting particular interest. Some of the biggest names whose work adorns museum walls include celebrated masters such as Rubens, Van Dyck, Caravaggio, Diego Velázquez, David, Renoir, and, of course, Monet, who lived and worked in a village not too far from here. 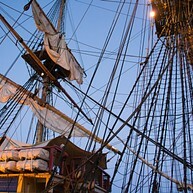 Every four to five years tall ships come down the banks of the Seine to celebrate L'Armada de la Liberté in Rouen. The gathering of all these ships is a huge festival featuring numerous events, and it goes on for about ten days. When walking down the Rue du Gros Horloge you will, soon enough, come across the splendid “Gros Horloge” itself. This beautiful clock is one of the most famous landmarks of Rouen, and likely the oldest mechanism of its intricate kind still in existence. You can go up the belfry and enjoy a cup of coffee in a café below right after. 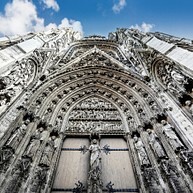 With a mix of architectural styles (with a heavy Gothic influence), this beautiful building is a must-see when in Rouen. Palais de Justice was restored after World War II, but is today just as glorious as it was in the 16th century. Entry isn't open to the public, but do pay a visit to the courtyard area. Rouen's principle square is the Place du Vieux-Marche. This is a great place to go for dinner since there are many restaurants and cafés located in the area. 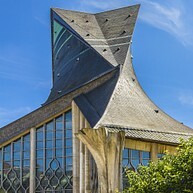 Here you can also find the modern Church of Saint Joan of Arc - an incredibly unique architectural creation, as well as a small covered market selling delightful French cheeses and deli. There is an oyster bar with fresh offerings at the market's heart. The courtyard of Ecole of the Beaux-Arts is both fascinating and slightly eerie, yet a beautiful place. This ancient cemetery was historically used for plague victim burials, although little speaks to it in the present. The building around it dates back to the 14th century. It's a great starting point for your sightseeing tour. With modern minimalist features, this dramatic church stands proudly on Place du Vieux-Marche in Rouen. This is the place where Saint Joan of Arc was burned at the stake, which is what the church's shape symbolises. 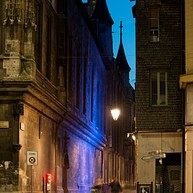 Rue Saint-Romain is a picturesque street running past the Cathedrale Notre-Dame de Rouen. This street is located in the heart of Rouen and is lined with Rouen's iconic half-timbered buildings dating back a few centuries. Take a stroll here on a lovely sunny day and drop into a boutique or cafe. 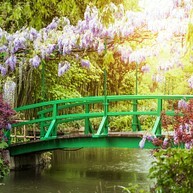 The well-known impressionist Claude Monet lived in Giverny his whole life. Today, you can visit his house and the very gardens that gave him inspiration to paint some of his most famous pieces of work. 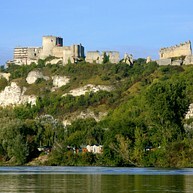 This fortress was ordered to be constructed by the legendary Richard Lionheart. It boasts spectacular views over the Seine River and will keep both adults and kids entertained while exploring the area. The château still stands 8 centuries after its inauguration, and is a major attraction despite the grim stories of its involuntary residents. 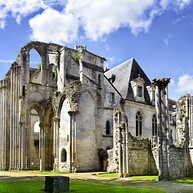 The ruins of the Benedictine monastery Jumièges Abbey are the oldest of their kind in Normandy. This early example of Romanesque architecture in the region is open for public visits and hosts temporary exhibitions. 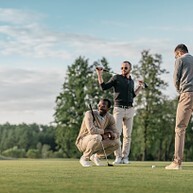 If you feel like enjoying a good game of golf in the beautiful landscape of Normandy, Golf du Vaudreuil is a great bet. Play a game at this beautiful 18-hole course and indulge in a good meal afterwards at the golf restaurant. Abbaye de Saint-Wandrille is a Benedictine monastery located in a small, delightful little village close to Rouen. There is an active monastic community inhabiting the abbey, which lives a frugal and humble life following the order of St Benedict. In an effort to raise funds to support the community and building maintenance, the monks even brew their own beer for sale - the only place in France where an operation of this kind is conducted within monastery walls. The monastery grounds hold well-preserved Medieval ruins. Just north of Val de Reuil you can find Biotropica, a park full of exciting animals and a tropical greenhouse. This is the perfect place to bring the children for a daily excursion and some great fun.